ATV Street Tires. Multi-Purpose ATV Tires Legal for the Street. Need some ATV street tires? That's not a very common question in the good ol' USA, but it does come up occasionally. There are a few states that allow ATVs on paved roads and certain organizations are allowed to operate them on hard surface streets. 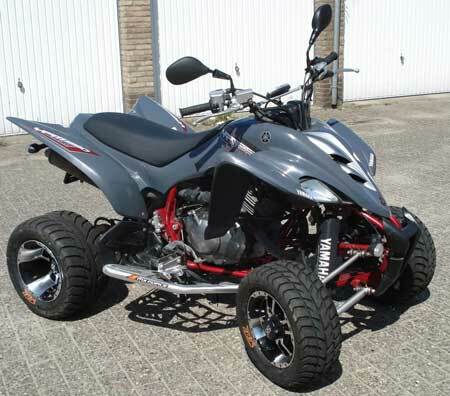 Europe, Asia, and many other parts of the world do have street legal ATVs so street tires are readily available. We thought we would check in on them and let you know what we found out. We found they have two basic types of street ATV tires. Want more details? Just keep reading. Or, if you want to see the best deals on DOT ATV tires today, just click the link. Maxxis Spearz street ATV tires. 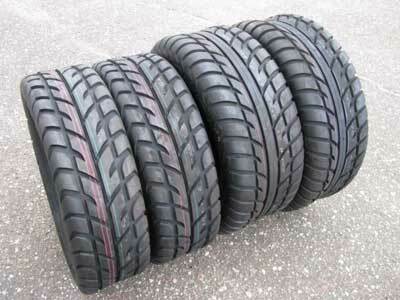 Types of ATV Street Tires. Primarily asphalt - Very similar to high performance automobile tires. Intended for street quads that rarely leave paved roads. A popular conversion is adding 14" wheels which makes it possible to run almost any auto tire in that size. The thing to remember is that you would need a very low profile 14" to equal the low center of gravity of the 12" tires. Maxxis Spearz are a top choice for 12" and smaller wheels. Here they are mounted on a street legal Yamaha Raptor in Europe. Now that looks like a fun way to see the Alps! Most of these street legal Quads are the same models we get in the USA. They just add mirrors, turn signals, horn, and the street tires. These folks know how to live! Primarily off road - Similar tread pattern to off road tires for 4x4 vehicles. These are more of a "dual sport" tire that is mainly for off road use but can be run on pavement for longer distances than a normal all terrain tire. 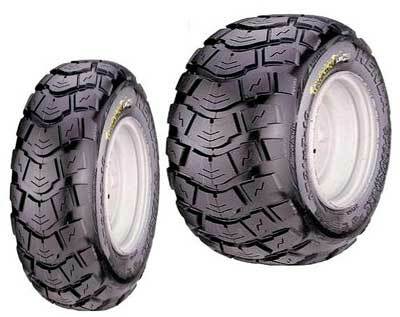 The Kenda RoadGo ATV tires are favorites for this type. Kenda RoadGo Street Quad Tires. 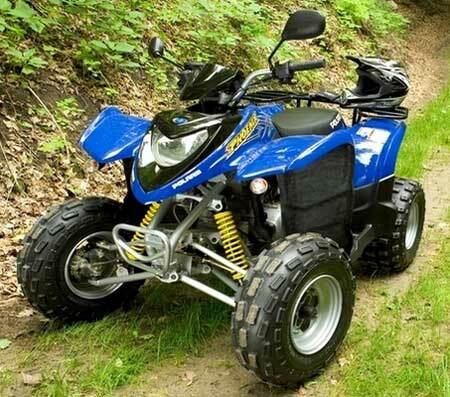 The photo below is a Polaris Phoenix in the UK equipped with a more serious all terrain type tire. They look more like a motocross tread pattern but are still approved for street use. This model looks identical to the one in the US except for the mirrors and turn signals. Street legal "dual sport" Polaris Phoenix in England. I don't know about you - but after seeing all these ATV street tires the rest of the world has - and the machines they can ride on the road - I'm depressed! I'll be in the shop bustin' some beads. 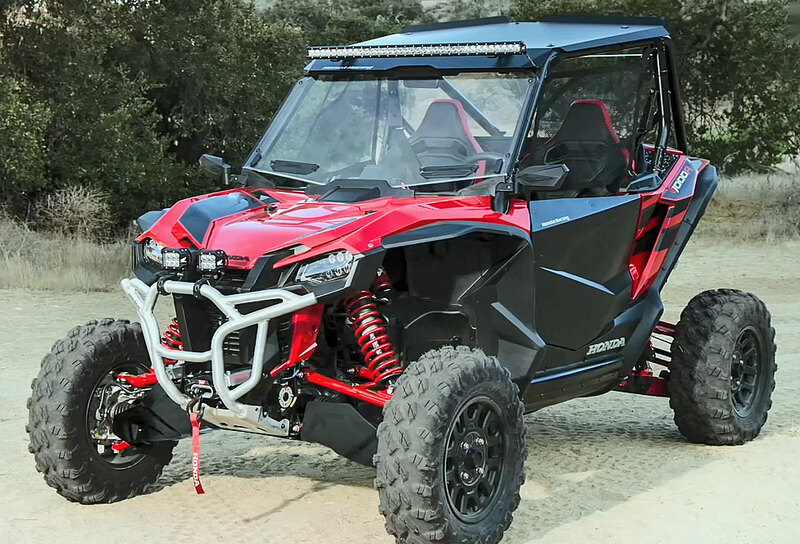 Return to Street Legal ATV Guide from ATV Street Tires.